Heinkels and Trojans came equipped with carbs from two different manufacturers: Bing and Pallas. 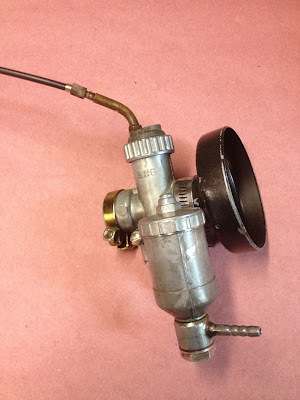 I've had some carb issues so I decided to dig in and fix them, and I learned a lot in the process that I thought would make a good blog post. Carbs wear out. I had a few Pallas carbs and one had a very worn slide with sloppy motion, and another with a hard-to-adjust mixture screw. 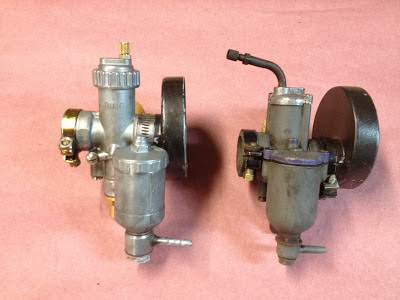 I used the best parts from each and came up with the carb pictured above. The largest impediment to using this carb was the lack of the proper throttle cable. Being at the end of a 3,000 mile long supply chain forces you to be creative, so I decided to make my own cable. I took an old scooter cable with the proper carb end, cut off the other end, and attached the brass piece to the other side. The first cable I made had an inner piece that was slightly too short, resulting in a consistently high idle. I decided to try again, and the next time made one that was slightly too long. I could get this to function, but it hampered my top speed (not really an issue to be honest while I was in the break in period).Then I decided I would order a cable from the German Club, and they sent me an incredibly short cable that I think was actually for a type 154 four wheeled scooter (these cars have the engine shifted to one side). However, I ordered two more, and after what I thought were relatively clear email discussions with the parts people, they all came the same short size. Lost in translation? I can't tell if Google failed me or I just wasn't meant to have the correct cable. My next brilliant idea was to get a replacement carb. There's a school of thought that says that the Pallas carb was a better unit than the Bing. However, the Bing company still exists and Pallas is defunct (I actually think they were bought by Bing). You can get Bing parts and the German club has brand new Bing carburetors. It would seem to me that "brand new with parts availability" is better than "old with no replacement spares". So, I went ahead and bought a brand new $400 Bing from the Heinkel Club of Germany. 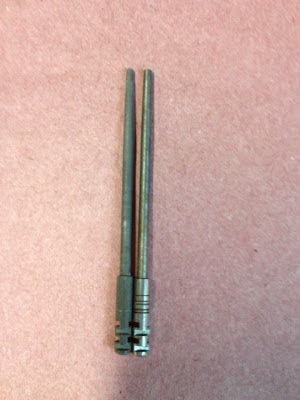 The first issue with the Bing carb was that it did not have the bent brass tube at the top. This meant that the cable I made would not come close to fitting. So, I went and made a third throttle cable from my supply of spare parts. I put it a new high tension coil, which didn't make a difference either. Wolfgang at the German club told me that none of these carbs had ever been returned for issues, so I was feeling pretty discouraged. At that point I decided to talk to Garry at the English club about a shifting issue I'd been having. I mentioned the rich running, and he told me that the English club used to sell these carbs and that they all came with scooter slide needles instead of car needles. He also told me that you could identify the car needle by the lines on the top of the needle; a car needle should have 5 incised lines. I measured them and noticed that the new needle is thicker throughout the length of the taper, which would theoretically fix the issue. I've also added a bent tube to the top of my carb so the English cable fits perfectly. Here's a picture of renovated Bing carb with the right needle, top, and cable. I hope to try it soon (after the snow melts) and I'll let you know.